Over at Destructible Man, the Flying Maciste Brothers have put out a call to all bloggers to present their favorite Animal Dummy Deaths ever committed to film for the first-ever Destructible Blogathon. 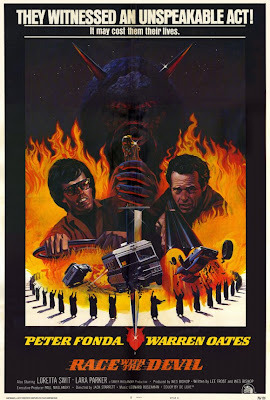 "We want everybody to bundle up," say Howard and Kevin Maciste, "dig deep into the recesses of their consciousness, fiddle about a bit and then go over to your laptops by the fireplace and post about the cinematic ANIMAL dummy death that you covet the most!" 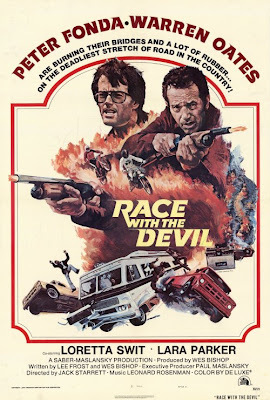 A car chase/horror hybrid about two vacationing couples in an RV who witness a human sacrifice and must outrun what has to be an entire county of devil worshippers, the film was set up at 20th Century Fox with Alan Ladd, Jr. and went into production as RACE WITH THE DEVIL. Not long after the cameras started rolling, however, Frost and Bishop were replaced by director Jack Starrett and producer Paul Maslansky. ...or as Deputy Sergeant Galt in FIRST BLOOD (1982), among others. When Starrett took over as director, R.G. Armstrong stepped into the Sheriff Taylor part. So many substitutions so soon into production! I've always thought this shot was a missed opportunity. Imagine the sweet foreshadowing substitution/deception we would've been blessed with if that sheriff's badge had only five points instead of six. OK everyone, quiet on the set! I'm ready for my closeup! Uhhhh, wait a sec -- why does that prop guy have a rope? ...not exactly a warm reception. Ginger belonged to Kelly, so former Dark Shadows femme fatale Parker gets to have an emotional moment with the fluffy doggy dum-dum. Captain America and John Dillinger quickly take control. Nah, this must be the one they got from the taxidermist. ...and the shadows of dummy snakes. During the climactic chase there is a more traditional but just as satisfying dummy appearance. ...alerting Roger, who's climbed up on the roof to take care of a meddling cultist. Hey, why are you doing that? That's all for now. Have a good night. Drive safely. And try not to die like a dog. Probably more fulfilling than having an emotional moment with Jonathan Frid.